So there is a first time for everything. Your first boat (February, check). Your first boat flip and dump into the water (March Training Camp – Aiken, SC, check). Your first Time Trial and 2,000m race (NSR-1, check). Your first loss and your first win (check and check). And finally we arrive at the first bump(s), well “big” bump–on the water. When rowing on the Connecticut River through Hartford, CT, your head needs to be on a swivel, constantly checking behind you for debris and floating odd objects. It could be compared to the necessary awareness required of the Head of the Charles. Perhaps not that crazy, but some days it feels like your trapped in the video game Frogger, but on the river. It should come as no surprise that all of the rain and recent storms ripping through the Northeast have wreaked havoc not only on land, but on the water. A couple of weeks ago, I managed to kill two fins–one was a legitimate “I was in a zone, working on something in my form and not watching the water behind me…and abruptly found myself stuck on a tree floating down the river” occurrence, while the other broken fin was less dramatic and unrealized until I docked and had my boat in its slings. It was possibly a rotted fin or I hit a smaller branch just hard enough to snap the small strip of metal that is cleverly designed to break to keep from ripping the entire bottom of the boat if the fin were to remain attached. 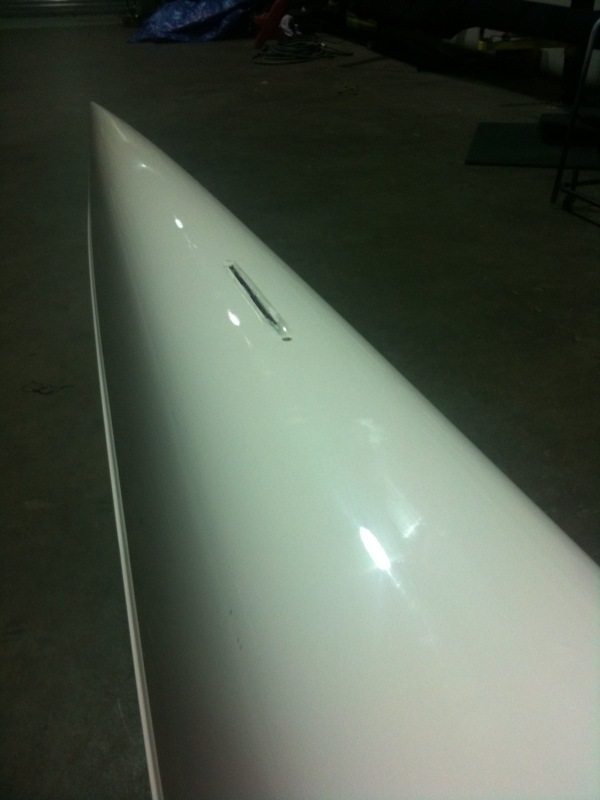 A fin is much easier to replace than the hull of your boat. Twice in one week...I'm now an expert at replacing fins. So two fins gone, a few days of dry land work in the books, and I was finally back on the water. I couldn’t help but recognize how those bumps on the water served as a metaphor for where I was in my training. I had allowed myself to become frustrated with some of my workouts. Whether it was fatigue, stress, or distraction, I just hadn’t been showing up the way I knew how to show up for my workouts. Routine training really should represent “competition” every day. Especially in a sport like rowing where you’re not always competing on a regular schedule, each day of training needs to be approached as a day of competition. This is similar to many endurance sports where the races are fewer and farther between than say, a basketball or softball league. Marathon runners and tri-athletes don’t have the luxury of competing every few days. You have to show up for training every day ready to race and beat your biggest opponent: yourself. This is an integral part of what I love about rowing. Each day there is a race to be won no matter how many boats are out on the water. Frustration and setbacks are intrinsic to any training regimen. Any athlete would attest that frustration is part of the process toward becoming great, as long as you don’t let it consume you and swallow you up. It’s what keeps us pushing harder and prepares us for the challenges we’re bound to meet during competition. Those setbacks serve to strengthen us mentally, emotionally, and strategically. Interesting. My experience is never one of feeling “consumed” or “swallowed up” but of circling a drain; it gets harder to stop my momentum the longer I let it go on. I find it absurd that I am happiest when I do that which I (really) do not want to do. That I continuously forget this about myself is, at times, even more frustrating than the frustration. Somewhere between 6-7am this morning, I got back on the wagon – such a great ride 🙂 Great post, keep ’em coming!